PONCE, PUERTO RICO - North Carolina National Guard SSG Joe Rodriguez carries donated water and MRE's for Nani Soto in a distribution center in a sports arena in the Southern town of Ponce, the 2nd largest city in Puerto Rico, on October 20, 2017. The U.S. military has deployed thousands of troops to help with the recovery effort, including units from Fort Bragg and Camp Lejeune. The North Carolina National Guard also is helping with the cleanup. 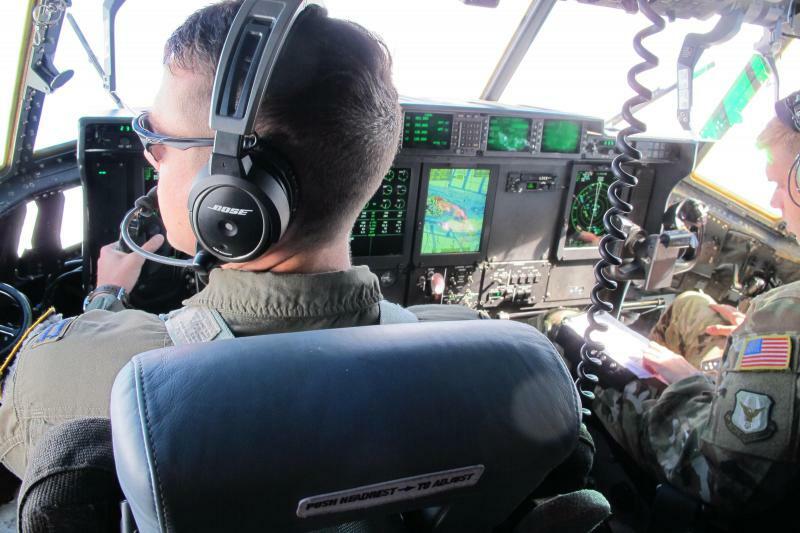 WUNC's Jay Price spoke with Morning Edition Host Eric Hodge about some of those military units and their mission in Puerto Rico. You've been in Puerto Rico since Thursday. What are you seeing? It’s a really, really unusual disaster recovery. The main island itself is about 110 miles long by 35 to 40 miles wide depending on where you measure it. It’s roughly rectangular in shape. The hurricane entered the island, it hit the island on its southeast corner, and ran almost a perfect diagonal course across the island and only a fraction of the island escaped hurricane forced winds and it came ashore as just barely a Cat. 5 so it was like, 155 mph. So hardly any of the island has escaped some form of destruction. And the damage is such that you have this kind of weird overlapping bits of issues. Over here you’ve got water but no electricity. Over there you’ve maybe got a little bit of electricity and no water, no food. Over there, the roads are damaged. And all of this kind of mixes and matches all the way across the island. It’s just the most widespread disaster are I think I’ve ever seen. If you looked at [Hurricane] Floyd, or you looked at Katrina, or some of the storm damage I looked at in Haiti, it’s often very discreet. It might be really, really cataclysmic, but more or less contained within a specific area. This is everywhere. There’s wind damage, there’s water damage. The big thing is electricity. Right now they’re claiming something close to 20 percent of electrical power is back up but I have yet to see a single house that I knew was connected to the grid. And I haven’t seen a single traffic signal that was operating. You spent some time with a North Carolina National Guard unit that's working in a more rural part of the island. What are they working ? The 105th Engineer Battalion out of Raeford near Fayetteville is leading a task force that’s working to repair and clear the roads, mainly that’s what they’re doing... I went out with a recon team up into the mountains and they’re still reaching communities that are still cut off by road. The road repair is a really crucial mission. It’s not the sexiest thing around but if they don’t have the roads fixed they can’t get the power fixed. If they don’t have the roads fixed, they can’t get water and food to people. In the first couple weeks after Maria hit, there was substantial criticism of the speed and size of the federal government's response. Do you have a sense whether it's improved since then? There’s a ton of relief workers here and a ton of agencies that work here. The convention center in San Juan is where all of this kind of converges. That’s kind of the headquarters for the recovery. FEMA is in there, and a host of agencies. They’re everywhere. I see FEMA agents out in the field. I see helicopters lifting major power transmission lines into place. The recovery is definitely happening and there are a lot of people who are doing it. There’s a lot of overlap, too. I see some people standing aside and waiting a minute, there’s two different agencies doing this. Water and food is coming in. But you still see people lined up for very basic things. Even in the city, they’re lined up for water. More than a week after Hurricane Maria, the Air Force continues daily medical evacuation flights from St. Croix. Patients are heading to South Carolina, Georgia, and elsewhere. 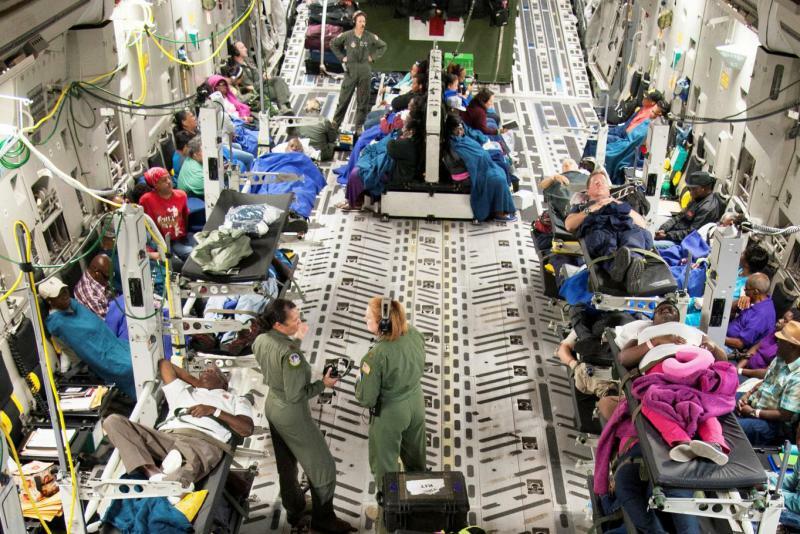 Military C-130 and C-17 aircraft have been outfitted with medical equipment, as the Air Force flies patients to hospitals in the mainland U.S.